Big or small, arrange a collection of objects that are somehow related and which perhaps tell a bit of a story. The objects are important, but remember it’s the light that will make it a really good shot. Still life is hard to do well. In fact, I think it is one of the most challenging areas of photography. When you walk to the shores of a great lake and see the mirror-surface reflecting the towering mountains on the opposite bank, with the trees feathering the line where rock meets sky, and the sun paints the dawn clouds pink, all you have to do is make the right exposure. In still life you become The Creator. It is up to you to place the tree in the perfect position and to make the sun rise in exactly the right place to pick the branches out against the dark rocky background. You become God and, all-controlling, you design the scene and you light it, you place the camera and you determine the exposure. There’s so much to think about and, while we all have access to interesting things to photograph, turning interesting objects into a successful picture takes a great deal of foresight and skill. Keeping things simple is the best way to start – one object and one light – and then once mastered more can be introduced. But even simple isn’t straight forward. So all things considered you’ve done very well in this round. There are some exceptional shots here and some high levels of skill on display. This year’s competition is being supported by Samsung, and this month’s first prize is the Samsung PL150 compact camera with dual LCD screens – one on the front as well as the back, and 12 million pixels. The second and third placed winners will receive a wonderful Amateur Photographer Loves My Pictures mug. The shortlist picture is coming – I have no screen grab software at the moment – but those who deserve a special mention are: IanJTurner, weefraz, PhilW, Mr Mischief, Hazem, Skiddawman and Brendan1980. There’s a hell of a lot of work gone into this picture, but hard work alone is never a guarantee of success. Taryn though has produced a picture that makes us all smile first and then demands our admiration for the skill with which it has been put together. 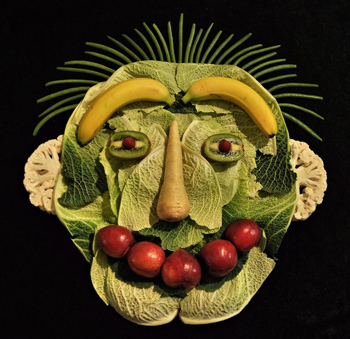 The layers of leaves really do reflect the shapes of facial features and while it would have been easy to have created something flat and basic, Taryn has gone to town and produced a three dimensional and detailed vegetable head. So there’s a prize for the work and the effort in making a subject, but it is the lighting that makes the features stand out so that we can see them and that reveals the shapes and layers used to build up the structure of the organic skull. The black background sets it all off nicely too. And I love the hair. I’m thinking of getting mine done that way. There are two things that make this picture work – the depth of field and the light. And those are the two most important elements in most pictures, and the two things we have to concentrate on for success. 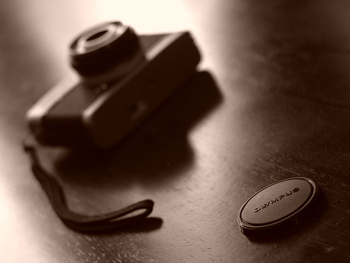 It is important too that Cas100uk has chosen to photograph an Olympus Trip, which is one of my favourite cameras. Even its bottom looks good. But I’ve ensured the subject choice has had no influence on my scoring – this is second because it’s a great shot. It’s a seemingly simple picture, and our eyes are drawn straight away to the lettering on the lens cap – as it is the only part of the scene that is in focus. Then the eye is taken on a diagonal journey across the frame, down that path of light, until it comes to the underside of the camera and its reflection in the table. The squiffy angle of the shooting-camera helps to speed up this passage of the eye. Were the strap placed on a light part of the surface it would have stood out more and drawn the eye directly from the lens cap, and taken us around the camera – almost bypassing it. As it is though, it merely acts as a return – the line we follow once we’ve taken the camera in. This is a very pleasing shot and well accomplished. Well done. Betinalap is getting a bit good at this game, and needs some stiffer competition. 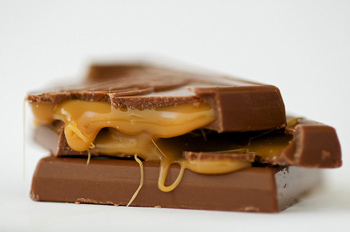 I’m writing this well before chocolate o’clock, but the sight of the caramel leaking from between the chocolaty layers has my mouth watering – and the indigestion on full alert. You’d have to be lactose intolerant to not be drawn to this image. You can taste what those things would be like in your mouth, and smell what your nose would experience were you to place your nostrils close to the warm, melting, soft, gooey slabs. The focus ensures we maintain our attention at the action-end of things, as if the draw were not strong enough already. And the softening into the distance delivers a faint hint of romance. The plain background gives us nothing with which to distract ourselves, and the clever backlighting aids depth and gives a sense of place rather than pure, factual, studio. Betinalap has produced an excellent example of food photography – if you want to eat it you know the picture has worked. Now it’s going to take super-human effort for me to have bran flakes for breakfast instead of stuffing my face with goodies pilfered from the kids’ sweetie-safe! If photography were music, still life would be the scales; if it were a language, still life would be Latin; if it were football, still life would be that silly exercise where you dribble the ball between stolen traffic cones. Still life is the basis of every picture we take – objects arranged, lit and then photographed from the right angle. When you can control everything you can see what works and what doesn’t, and you can move the landscape and the sun and yourself until it you have the perfect combination. Some people think still life is boring, but if you master it well all of photography will be your kingdom.